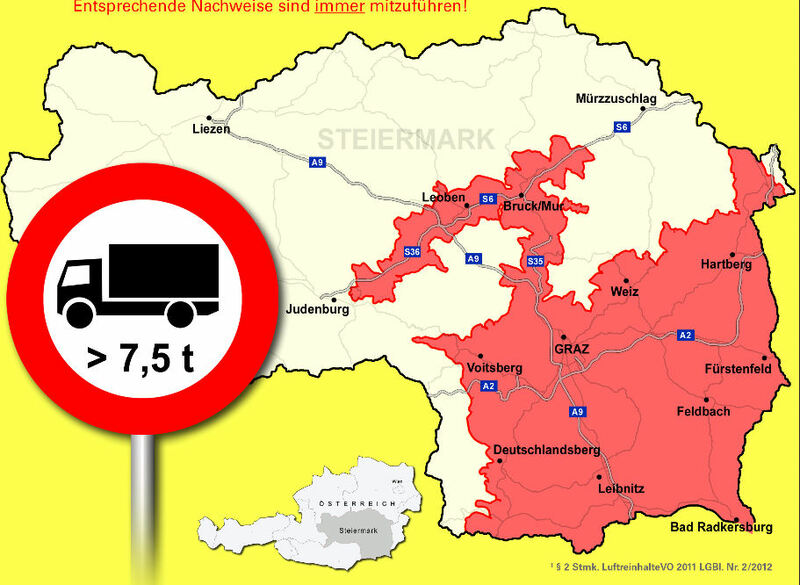 The restriction applies to some areas of the district: Graz and its surroundings, Murtal, Bruck-Mürzzuschlag, Leoben, Deutschlandsberg, Hartberg-Fürstenfeld, Leibnitz, Voitsberg, and Weiz. - restrictions for vehicles of category N (heavy goods vehicles with a maximum weight exceeding 7.5 tonnes that were first registered prior to 1992, inclusive of vehicles with trailer and articulated vehicles), with emission class EURO 0. Entry allowed with emission class Euro 1 and higher. - restrictions for vehicles of category N (heavy goods vehicles with a maximum weight exceeding 7.5 tonnes inclusive of vehicles with trailer and articulated vehicles), with emission class EURO 1. Entry allowed with emission class EURO 2 and higher. - restrictions for vehicles of category N (heavy goods vehicles with a maximum weight exceeding 7.5 tonnes inclusive of vehicles with trailer and articulated vehicles), emission class Euro 2. Entry allowed with emission class EURO 3 and higher. Are you going to Styria by private or business car? From 1. 1. 2014, a restriction applies to vehicles in categories N1, N2 and N3, allowing entrance only to vehicles falling within the EURO 3 emissions class and above. Entrance to the low-emissions zone of Styria requires that the coloured Pickerl plaque be affixed. This plaque states the emissions class. The large cities of Graz, Leoben, and Weis, as well as the towns and districts of Murtal, Bruck-Mürzzuschlag, Deutschlandsberg, Hartberg-Fürstenfeld, Leibnitz and Voitsberg, are part of the low-emissions zone. Order your environmental badge to enter Styria and get free shipping! Travelling To Styria By Car?